The minigame that's almost as good as the game itself. In Why I Love, PC Gamer writers pick an aspect of PC gaming that they love and write about why it's brilliant. This week, Sam plays a few hands in Triple Triad. No matter where you find yourself, the people there play Triple Triad. 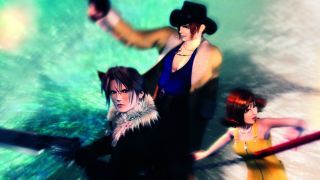 FFVIII has an alternate talk button that challenges NPCs in each environment to a game. The scene then cuts away to a 9x9 grid, where ludicrously catchy, jaunty gambling music kicks in. If you love Triple Triad, you might want to check out the fan-made version that's giving the minigame a new lease of life.